Richard's Blog: Is it really you? My 'online existence' (such as it is) has just passed a milestone - I've rejected my first "be my friend" request on Facebook. I'd never heard of the guy! If you've not yet dipped your toes into the somewhat choppy waters of that particular 'social networking site', then my action may seem either (a) rather cruel and not-something-to-be-admitted-to by-a-vicar-in-polite-company or (b) rather trivial news for a Tuesday morning... or quite probably both. 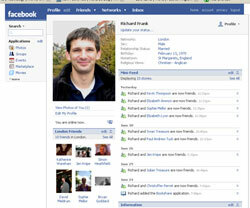 Facebook is a site you register (for free) at, with as much or as little about yourself as you're willing to reveal - but usually with your real name (more of that below) and with the intention of hooking up with people you already know in real life, or at least with people with whom you have some sort of connection or interest in common. ...and it is, apparently, the second most visited site on the web (surpassed only by MySpace - a similar, though rather less staid, social networking site). One of the great attractions of Facebook is precisely that you are yourself on it - making online connections with 'real people' and being able to share something about yourself with them (eg what you're listening to, doing, watching etc). Then came this piece on the BBC website yesterday: Are my online friends for real? I met somebody the other day who told me that online networking was so important, and he didn't have the time, he was paying somebody to be him online. To blog, network, post etc . £1,000 a month too. ...Apparently it's a new occupation which he reckons already numbers hundreds of people, paid to be other people! Now, aside from the thought of being paid £1000 to blog for someone else (! ), it's an interesting insight into the way that 'being personally accessible' (or, at least, giving the impression of that) is so important these days for even those in the business world, let alone politics (where we've already got used to thought that a possible future Prime Minister would make a YouTube video in his own kitchen at home whilst loading the dishwasher). At the same time, the more visible we are to a wider group of people, the more tempting (or perhaps necessary??) it is to present a varnished, perfected model - and perhaps to lose track of who we really are. P.S. ...and if you meet someone called Steve complaining at his old friend Richard's rude behaviour... let me know! I have to admit that much of my personal and social life is conducted without any face to face contact. Not having the internet for a fortnight recently whilst moving house rendered me feeling utterly isolated, out of the loop and feeling really very miserable. It's become really quiet on here. Has everyone 'defected' to Facebook? ?